It’s been a year since I posted a recipe, and the last one was inspired by my Grandmother’s Banana Bread. This recipe is ALSO an inspiration of one of my Grandmother’s recipes as well. Her’s is called a “Chili Cheese Puff” and it’s unbelievably tasty. I would ask for that and her “Potato Casserole” for my birthday — instead of cake. This recipe is a more flexible version of her “Chili Cheese Puff” and has less cheese and no chilis. My favorite part about this recipe is (well, two things): 1) Your toddler can help you make this and 2) you can make it at the beginning of the week and eat a slice a day! An easy and fast breakfast that my kid loves. What I love about this recipe is that the base stays the same, but you can make it your own by adding pretty much any vegetable you have on hand. Green beans? Sure. Want more cheese? Throw it on top. Preheat oven to 350°F. 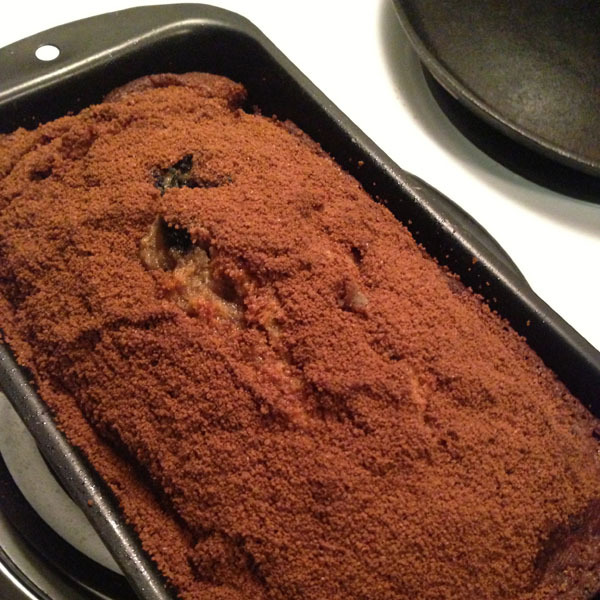 Oil a 9×13 baking pan or 2 round cake pans. Take up the large bowl. Crack and whisk in the entire dozen eggs. Sprinkle in salt and pepper. Dump entire contents of cottage cheese container. Stir. Add in your desired veggies, one at a time and stir them all together. This is where having your toddler helps is great! In fact, studies have shown that kids who help prepare their meals are more likely to eat them AND more likely to try new things. Once everything is mixed, pour the mixture into your desired baking dish. The two cake pans will cook easily in 45 minutes. The larger baking sheet may take closer to an hour. Place your baking dish in the oven and set your timer for 45 minutes! When a knife can be inserted into the middle of quiche and come out relatively clean, it’s done! I’ve been craving banana bread lately. Maybe it’s because it’s summer and I used to spend lots of time at my Grandmother’s house during the summer and HER banana bread is the BEST I’ve ever had. But, this isn’t her recipe. I had planned on sharing her’s with you, but then I realized it called for butter and I didn’t have any… shoot! I also wanted banana with a crumble topping like the spice muffins from Mimi’s Cafe, so I set out to find a banana bread and crumble topping and found this one from bon appetit! I also decided that I REALLY wanted it to have blueberries so I added those to the recipe and altered the crumble topping a bit. Preheat oven to 350°F. Oil and flour 9x5x3-inch metal baking pan. Whisk next 5 ingredients in large bowl until smooth. Add dry ingredients; stir to blend. Then, add those oh so tasty blueberries. Mix 2 tablespoons sugar, 1 teaspoon cinnamon, and brown sugar; sprinkle over batter. Bake bread until toothpick inserted into center comes out clean, about 1 hour. Honestly, if it’s not ready in 60 minutes, only add 2 mins at a time otherwise you’ll over-bake it. Cool bread in pan 30 minutes (Or don’t. I didn’t). What I love about this recipe is how fast it is! 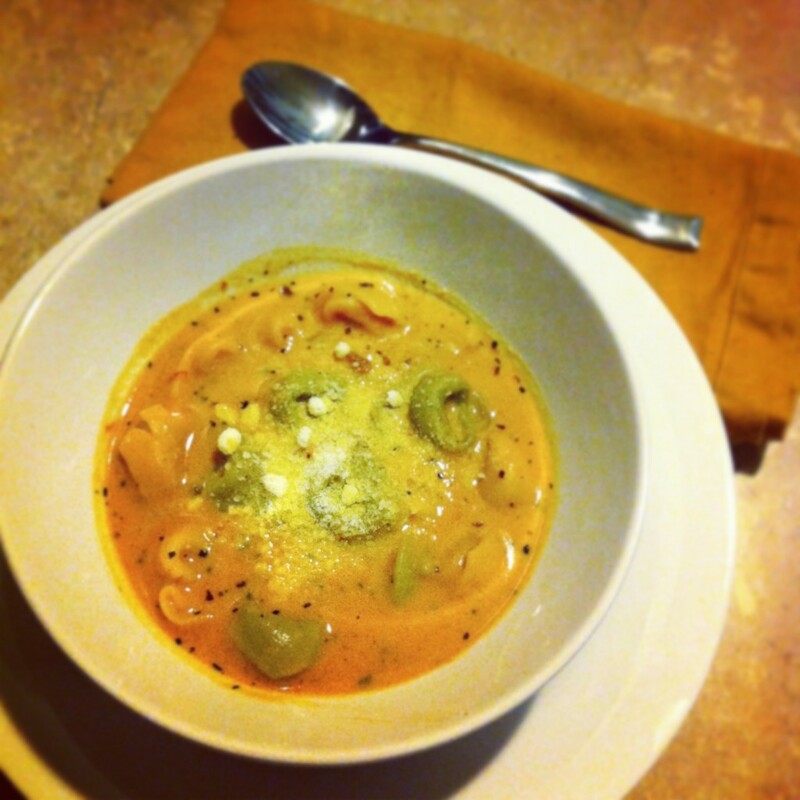 Only 15 mins for a tasty and hearty soup, that’s easy to reheat for leftovers throughout the week. Or, a great last minute meal for small gatherings. Add in the tomato soup, sun-dried tomatoes, half-n-half, chicken stock and spices. Bring to a simmer. Once simmering, drop uncooked tortellini into the soup. Cook about 12 minutes, until the tortellini is cooked through. You can also serve this with a side salad and toasted baguette. 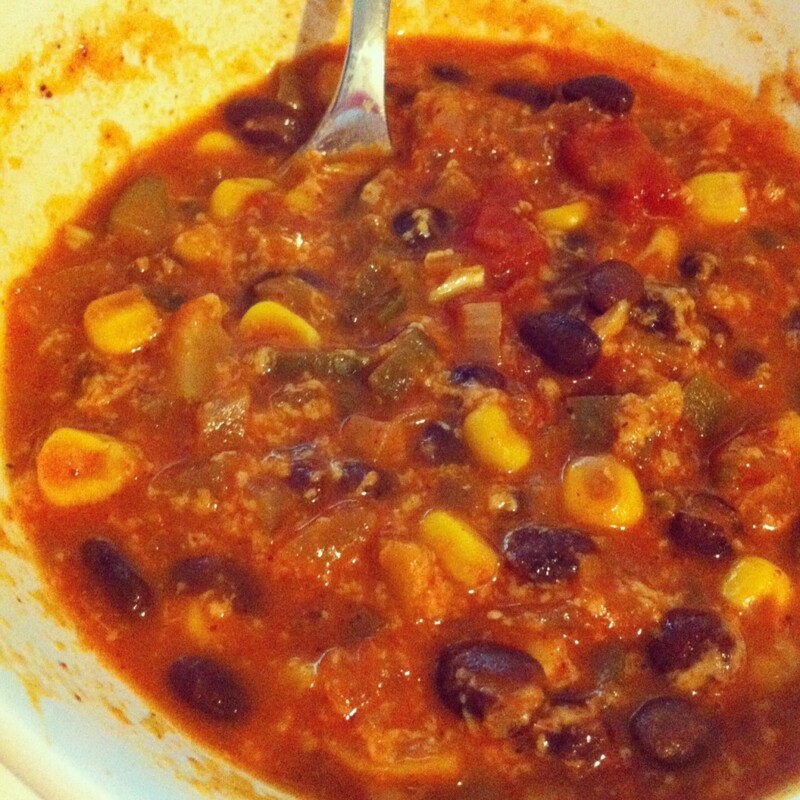 This chili is so tasty and I guarantee any meat eaters in your family will LOVE this soup because it’s very hearty. Some of the changes I made, I believe, make the soup taste better but you can always use fresh ingredients — it just may need a bit more seasoning. This also reheats GREAT for leftovers during the week. TIP: Do all the prep before, it makes the cooking process much faster. In a large pot heat the oil over medium heat, until it coats the pan. Add the onions, bell peppers, garlic, and serrano peppers, and cook until soft (about 3 minutes). Add the zucchini and corn, cooking until soft and the vegetables give off their liquid (about 6 minutes). Add the chili powder, cumin, salt and cayenne, and stir. Add the tomatoes, the beans, tomato sauce, and vegetable stock, stir well, and bring to a boil. Reduce the heat to a simmer for 20 minutes. (If you’re cooking white rice, you can start cooking that now). To serve, place 1/4 cup of rice in the bottom of each bowl. Ladle the chili into the bowls over the rice. Top each serving with a dollop of sour cream and spoonful of avocado. I know what you’re thinking… WHAT?!?! a recipe? Yes. 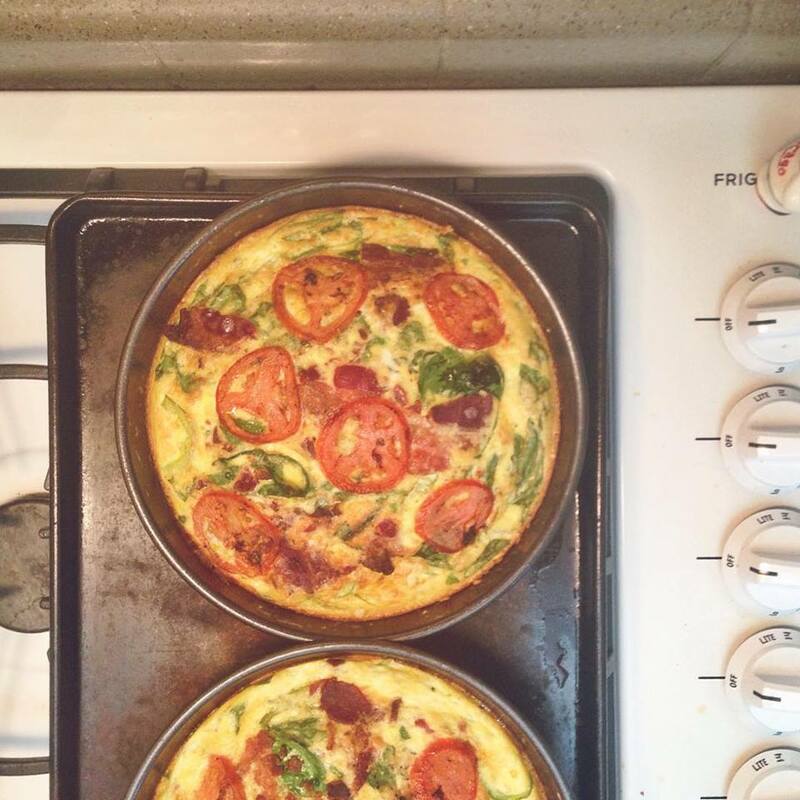 I’m back to cooking again and it feels so good! I was getting tired of eating out and quick fast food runs when the craving struck. 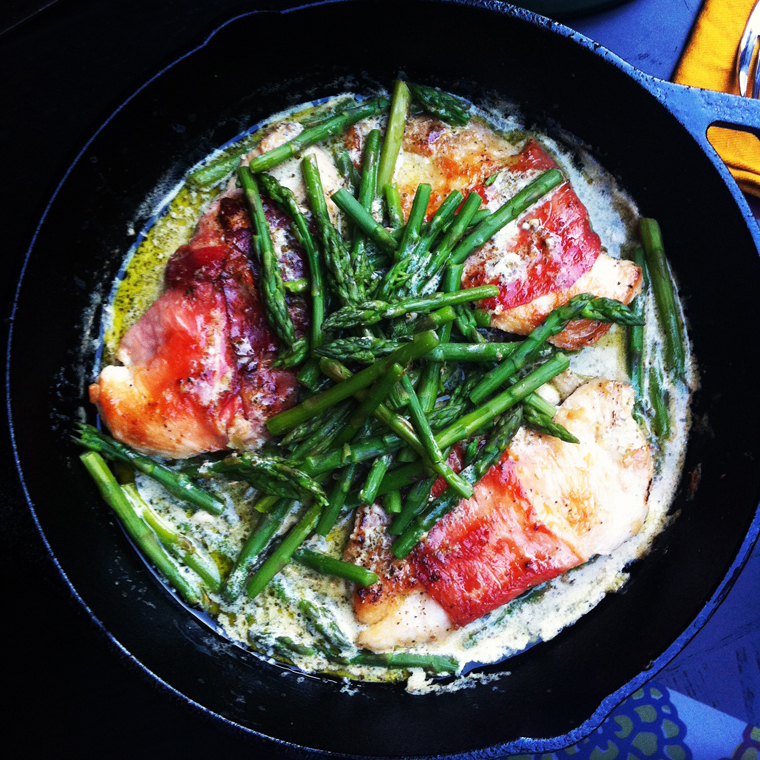 This week I made salmon and asparagus (a veggie I haven’t been able to stomach for 4 months)! 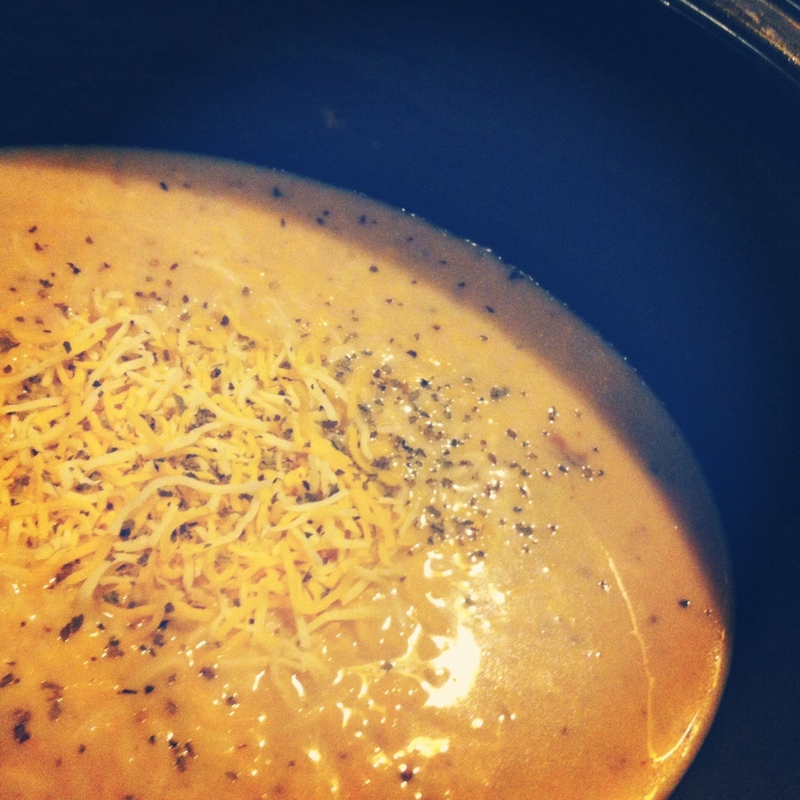 So, anyway, I’m so happy to share one of my favorite recipes — Baked Potato Soup. It’s not a very involved soup and it is very hearty, especially with the bacon fat cooked into the onions. Oh yeah, you know you want some. In a large saucepan, cook up the three strips of bacon until crisp. Drain the fat, but reserve about 1 tablespoon of the drippings. In the same pan, saute the chopped onion and garlic until tender (This smells sooooo good — sorry to all the vegetarians out there). Stir in the flour, salt, basil and pepper. Slowly add in the chicken broth and bring it to boil. Then stir for 2 minutes. Add the potatoes, cream and hot pepper sauce; heat thoroughly. This soup thickens up quite a bit so if you feel like you need to add some milk or more chicken broth, feel free! Serve it up with the bacon (or stir that stuff right in there — Nom). Don’t forgot to top it with cheese. LOTS. Guys, I’m not lying — this dish is so freaking good. Seriously guys, enjoy making this fast, tasty and easily Gfree meal. Nom. Major Nom. In a cast iron skillet heat up a few tablespoons of olive oil. Lightly coat the chicken in flour (optional). Wrap each piece of chicken in 1-2 slices of proscuitto and place them in the skillet, 5-7 minutes on each side until browned. While that is cooking, trim and snap the asparagus. Pour in 1/8 – 1/4 cup of half n’ half and mix in about 1-2 tablespoons of pesto. Add a dash of flour to thicken (optional). Serve with either warm bread or pasta. This tasty salad is extra filling. Add whatever your heart desires, but these are some of the ingredients I love. > We buy the “heads” of romaine, so simply chop it up and place it into a large bowl. > Garnish with chopped cooked turkey bacon (optional) dressing and lime wedges. If you’re like me, eating hot food for lunch in the summer doesn’t sound so hot. I find myself craving fruits and salads or tuna sandwiches but I often get bored with the same old salad. So, I thought I would do some research and start mixing it up a bit! 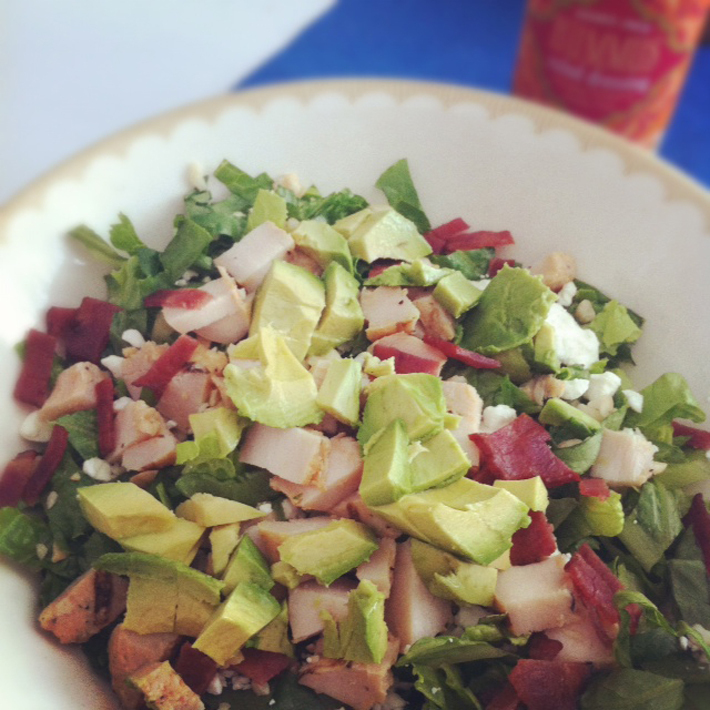 This week (and as I find more to make/share) I’ll be posting about yummy, awesome, and pretty low cal salads. First off, my favorite. 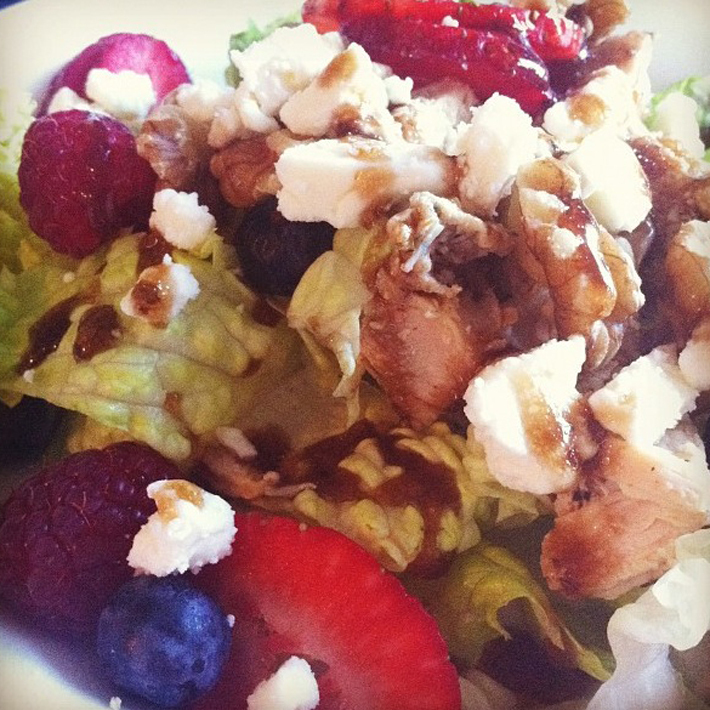 The first time I had this salad was with my friend Bree at the Glen Ivy Day Spa for her birthday a million years ago. It was magical and tasty and I crave it always. I hope you enjoy. > Take two LARGE handfuls of spinach, chop it on a cutting board and place it in a large bowl. > Cube chicken (that sounds gross — like artificial chicken or something. Nevertheless, do it) layer it on top of the spinach. > Core and chop the apples. Layer them on. > Cut up strawberries (if using) and layer them with the raspberries and blueberries. > Crumble feta cheese on top. > Sprinkle walnuts or almonds. > Serve with Champagne Pear Vinaigrette from Trader’s (if you do this you actually might not need the feta as there is cheese in the dressing) or Balsamic Vinaigrette. > Preheat the oven to 400 degrees. > Half bell peppers and seed them. Coat them in olive oil and place in a baking dish. > Cook for 20-25 minutes. > While the bell peppers are cooking, cook turkey meat AND cook the rice (20 mins for white and 40 mins for brown). > In another pan cook chopped onion until browned. Then add cooked rice, black beans and corn until heated through. > In a large mixing bowl add the taco seasoning, cooked ground turkey, chopped onions, black beans, corn and rice. Add in the jar of salsa and mix well. > Stuff the turkey into each half of the bell peppers and place back into the baking dish. > Cook the peppers for another 15-20 minutes. 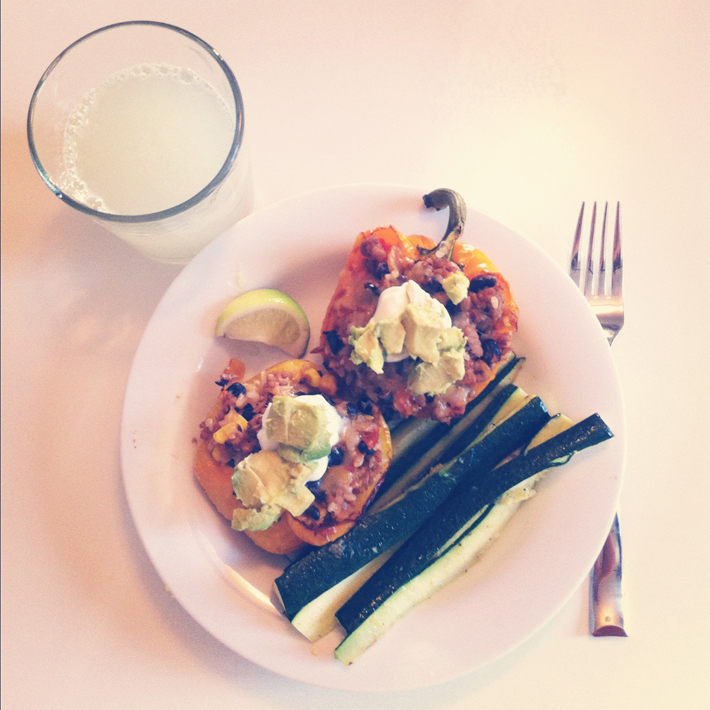 > Sprinkle the tops of each pepper with shredded cheddar cheese. Place back in the oven to melt the cheese. > Top with avocado slices and sour cream just before serving. P.S. You might have some stuffing left after — it’s perfect to mix with some scrambled eggs in the morning for a Spanish Scramble! P.P.S. For a vegetarian meal, cut out the meat and add quinoa and sautéed veggies. Well, I’m here to tell you, “YES!” These little super foods are actually super delicious. Hear me out, I’m not talking about steamed and mushy brussel sprouts. 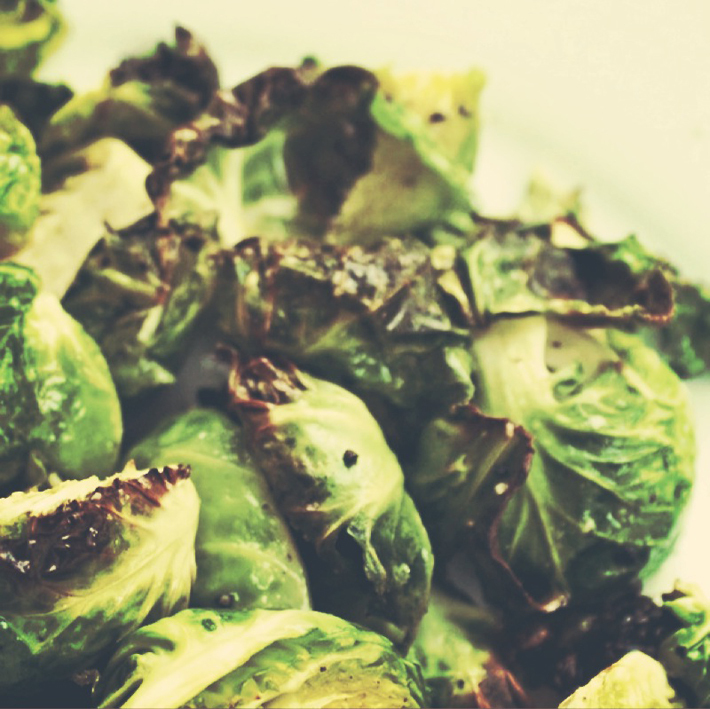 I’m talking about olive oil and garlic and roasty-toasty brussel sprouts. Its amazing. I promise. Even my husband likes them. > Rise sprouts and cut ends. Then cut into halves or quarters, depending on the size. > Mince 2 cloves of garlic. > Place sprouts in a Pyrex dish with olive oil and toss. > Sprinkle with salt and pepper to taste. > Roast for 25-30 mins, until just browned. > Toss in minced garlic and roast for an additional 5-10 minutes until sprouts are browned.